Sweet Christmas, this is the second book in a row that I really enjoyed. I’m wonder if I am not doing the reading-for-pleasure thing correctly this year that I’m so surprised when I really enjoy a book. 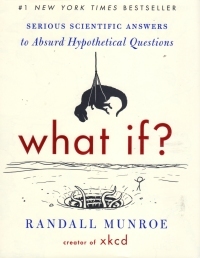 This book is a collection of crazy, mostly physics-oriented hypothetical questions answered seriously and with actual math. The author created the xkcd Web comic and includes a section on the Web site going over questions like this (and the book is a collection of things that first appeared on the Web site, likely). Things like “What would happen if the Earth and all terrestrial objects suddenly stopped spinning, but the atmosphere retained its velocity?” and “What would happen if you tried to hit a baseball pitched at 90% the speed of light?” I don’t want to spoil it for you, but the answer to many of the questions is cataclysm. Perhaps I enjoyed the book more than other Internet sites bound and printed that I’ve read (Jump the Shark, Awkward Family Pet Photos, and two Darwin Award books–The Darwin Awards II and The Official Darwin Awards 3) because I was not as familiar with the material. Or perhaps it was because the material and the content is a little deeper. It’s not popular culture, it’s not pictures with snarky captions, it’s science. Or at least musings therein. I’m not qualified to judge whether the physics work out on his answers–I’m sure the Web site’s comments section are full of robust arguments about the answers–but it’s good enough for someone with a philosophy degree who just likes to speculate. At any rate, a good, fun read. I wish I could remember on whose Web site I saw this on. I’m becoming quite the little follower, where people like Dustbury or Instapundit post links to books or music I might find interesting, and then I rush out and buy it. Perhaps I should stay off the Internet until I read some of these thousands of books I own that I have not yet read. Or maybe not. Also, the string of two fun, enjoyable reads daunts me a bit as I look at the bookshelves trying to pick something to read now (no, not one of the books already on my side table with bookmarks in them–I want something new). I might not pick something I enjoy as much and might end up with something that remains on my side table for months (or, heaven forfend, years). The pressure can prove overwhelming. So I’ll likely pick out the next Executioner novel and slog through it.